Charity auctions are commonplace in Hollywood, but next week, something incredible will be up for bid: Ron Swanson’s Mustache. That is not a misprint. On Thursday, August 23, some incredibly lucky soul will have possession of the most incredible piece of TV foliage since the Magnum, P.I era. Do not worry: No government employees were harmed in pursuit of this charitable goal. The Because of Ezra foundation is certainly a good cause. Designed to help children suffering from solid-mass pediatric cancers, it was founded after web businessman Kyle Matthews and his wife Robyn lost their young son Ezra to pediatric cancer. Hollywood talent agency UTA and a bunch of TV industry execs (as well as HBO, CBS and FX) have helped spearhead the annual fundraiser. If you’re in LA, you can still buy tickets for the event here. And if you’re not? There’s still time to jump on a plane and make a bid in person, because: RON EFFING SWANSON’S MUSTACHE. UPDATE: Can’t make it to the auction in person? 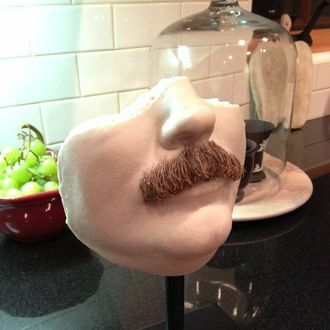 Send an email to offermanmustache@gmail.com for info on how you might yet end up owning the Nick Offerman Mustachium.